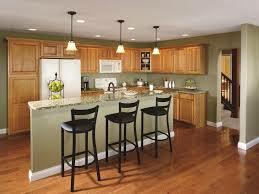 Cabinets are an essential piece in your home for practical use as well as style. Taking the time to research your units will lead to much better results, a more functional home and a kitchen that looks exactly how you picture it. Thankfully after this Aristokraft cabinet reviews guide, you'll be one step closer! To get the perfect kitchen cabinet you need to look not only at the specifications and the options, but to the manufacturer themselves. There’s a lot of cabinet makers out there, some new and some old, and understanding the values they have can help you make an informed decision. Plus if something goes wrong it’s always better to have a responsible company that will help you out. Thankfully with Aristokraft you don’t have to worry about a thing! Aristokraft has a long, successful history. Founded in 1954 as a single store It’s grown rapidly to become a household name. They have their beginnings in custom made cabinetry and even though they’ve diversified to produce other home solutions, it’s kitchen cabinets that are their speciality. With over 60 years of manufacturing they’ve shown considerable expertise in the industry. Aristokraft focus is on value, specifically value for the customer. They host an impressive amount of styles and selections (read on for more) but they aim to keep everything cost effective. They believe in making people happy, aiming not just to produce cabinets but to make homeowners happy. 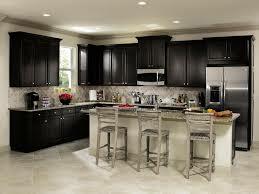 The result is a company that is working hard to produce low cost cabinets that will add value to your home. Aristokraft are a part of the Masterbrand Cabinets group who are the number 1 cabinet producer in the United States. There are high standards to be a part of the group and products are regulated thoroughly- adding to the high standards of the production line. Other brands in this group are Schrock, and Diamond cabinets, which both are excellent choices with two distinctive looks. Aristokraft only let certified suppliers stock their products. They believe in keeping the standards high for the whole buying experience so while you will find Aristokraft in most stores you can be sure they’ve checked them all out. The retailers will assist will design specifications and measurements while Aristokraft themselves deal with production. Aristokraft produce storage solutions for the whole home. There are a range of bathroom cabinets and accessories but the focus of Aristokraft has always been their kitchen units. With a range of base units, tall units and wall mounted cabinets there is a good amount of variety with Aristokraft. They also offer specialist moldings on the top of units which adds an element of class to your unit, especially if you own an older home. For Aristokraft cabinets there are a few main choices: plywood, furniture board and hardwood. Plywood is normally the cheapest, with layers of veneer on top of one another while hardwood is the most expensive but more durable. It really depends on your preferences and your style of kitchen, the best thing to do is search around until you find the right fit for you. All of the options offer slightly different textures and colouring so it depends on your kitchen what you’d want to go for. I definitely recommend the Cherry, and if you like cherry wood you should also check out Starmark Cabinets and Kemper Cabinets! Retailers will be able to show you examples of each type of door so you can get a better idea of which you prefer. Be sure to check them all out before purchasing. Aristokraft offer a range of finishes for you unit to make it unique to your home. There are over 50 to choose from, each dependant on your choice of wood, these include Autumn, Wheat and Natural. There’s also a choice of colours available. 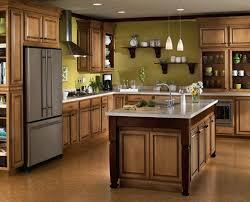 With such a large variety you’ll be able to find the right option for your kitchen cabinet. There is the choice of a light, medium or dark tone which will allow you to match your Aristokraft cabinet to your existing fittings without clashing. Another company that offers a huge range of finishes is Brookhaven. Aristokraft have two different types of door available. The first is their core range which offers all of the usual choices and styles. You can also opt for the Plus range which gives you an even greater selection of colours, paints and allows for the laminate style. The plus range is a little more expensive but worth considering if it fits in with your home decoration. Aristokraft mouldings go on top of their wall mounted units. These are available as extras to help add an element of class to your cabinet. There are 49 different embellishments to choose from, it’s a great way to make a semi custom cabinet appear custom made. They aren’t for everyone but if it’s within your budget it’s definitely worth checking out. Aristokraft also offer a range of extras including custom door knobs and handles. With this extra hardware you can make the picture in your head a reality and it gives you further control of the design process. Aristokraft are offering a really wide range of options to make the cabinet unique to you. Be sure to explore all of the options available and check the costs before confirming anything with your local retailer. Aristokraft standard base units are 35 inches high, 23 ¾ inches deep with a ¾ inch thick shelf. Standard Aristokraft drawers have ½ inch thick furniture board sides on roll trays but if you upgrade to the select range you’ll get ¾ inch hardboard drawers on with dovetailed joints. These will last a lot longer and are more reliable. There is the option to upgrade the drawers with smart stop technology to stop slamming and breakage, perfect in a household with children. Depending on your material and options the specifications may vary slightly. Aristokraft supervise all of their production within the United States. This allows them full control of the manufacture of their cabinets. The units are well designed to be practical in the modern home with innovative solutions being rolled out on new models. They invest in researching and developing additional solutions which are available as add ons. Aristokraft pass the high levels of scrutiny that Masterbrand put on each of their associates. They’re used by builders and homeowners across the country as a cost effective cabinet designer, not just for kitchens but throughout the home. The long history of Aristokraft backs up the quality they are putting into each unit. For over 50 years they’ve been producing cabinets that let people spend less but have more. Ultimately in the cabinet industry you get what you pay for, so you can’t expect the same high levels of quality as you would in a high end custom product. However Aristokraft cabinets are well made and the wide range of design options makes them a great option in many homes. Aristokraft back up all of their products with a 5 year warranty. This covers all workmanship and any defects in the material. What’s more impressive is the lifetime warranty given on all hinges and drawer guides. This shows real confidence in their product and gives you confidence in their product because you’ll easily be able to replace any faulty party. The Aristokraft warranty is fair and there are numerous reviews of them being willing to uphold it without a fuss. When buying any cabinet it’s important to look at the reviews to better understand a product and a company. As with all reviews there is a mix for Aristokraft so let’s take a look at what people are saying. We did a kitchen remodeling job ten years ago and we went with Aristokraft Cabinets, and these cabinets have held up very well. I have had no problems with the drawers and the pulls and the color is still very nice, cherry/maple, probably more maple. Although the majority of the user reviews were quite positive, there were a few concerns that some customers had. The most common complaints are around the products not holding up over time, specifically peeling wood and damaged products. 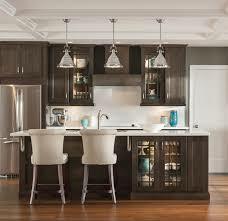 "I have these cabinets in a 4,500 square feet home. After just six years we are going to have to replace the cabinets or the paint because it is already chipping and peeling." - Jeśus T.
This mistakes will happen in every company however they can be very frustrating in your own home. Be sure to check and double check everything while it is being delivered and fitted and allow a little time if anything needs to be replaced. Also be sure to go through the warranty with your retailer so you know what you’re entitled to. Aristokraft are based around value and this means keeping their prices low for the customer. They will never have the high quality of the high end brands but they will also never charge as much. Our advice would be to upgrade whenever possible, use the hardwood if you can and if your budget allows. This way you’ll see a better cabinet which lasts longer and ultimately brings more value. The cabinet industry has a lot of competition but ultimately it’s worth remembering you get what you pay for. Aristokraft is primarily for those on a tighter budget who still want some quality, and that is what they offer. Just bear in mind that it is all relative and to expect the same from a low-mid range supplier as you would from a high end manufacturer is setting yourself up for failure. 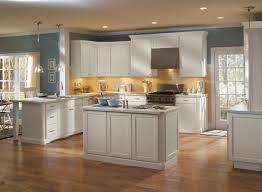 I would compare Aristokraft to brands like Thomasville and Shenandoah cabinets. That said Aristokraft is offering some great quality products and if your budget is in this region then they’re a solid choice for you. Just take the time to look at all of their options, how durable they’ll be and how they’ll end up looking. Aristokraft have been delivering value for over 50 years and are certainly a great choice for your home.